One Giant Leap . . .
45 Years Ago . . .
With bleary eyes I glanced at the clock. Almost 4 AM and somehow, I was still awake. I had just turned 14 and I was determined to watch the live broadcast of mankind’s first step onto the surface of the moon. What would happen? Would he sink in the lunar dust? Would a lunar xenooctopoid grab his leg and pull him under the surface of the lunar soil? Would his spacesuit explode in the vacuum and splatter frozen blood and guts all over the black and white camera poised to show the world this most historic moment? My nephew, Keith, had decided to stay up with me. He was only 10 at the time and he was not happy about being awake at this early hour. My father, a raving space enthusiast, had gone on to bed. After all, he had to work the next day and all I had to do was sleep in on a hot, lazy July morning. The year was 1969. The world was on fire. War protests raged across America demanding an end to the Vietnam War. Rock music filled with the raucous, explosive anger of millions of young adults vibrated across our radios. Angry women marched in the streets demanding equality. Fury still washed across the country from the assassination of Martin Luther King, Jr. and racial tensions were at an all time high. And, most teenagers and young adults were high on acid, heroin, marijuana, speed, quaaludes, opium, hash, you name it. Our new president, Richard Nixon would soon be rocked by a political scandal that would force him out of office. Communism in the guise of “socialism” was sweeping across the world from the USSR and into Eastern Europe, South America, and Cuba. Every single minute of every single day, I lived under the threat of instantaneous mutual nuclear annihilation. My future was bleak. Would I end up in a body bag on the other side of the world? Would I die in a race riot or war protest? What kind of world was I inheriting? My parents had grown up during the Great Depression and World War II. Their values were deep and abiding — strong, stoic people who knew the difference between right and wrong and could easily tell a lie from the truth. Fortunately for me, those values had been ingrained into my very being. “You may be better off than someone else, but you are no better than anyone else.” My mother always told me. There was no difference between black and white, she said. We were all one flesh in God’s eyes. I never had to wrestle with the typical racist attitude imbedded in the very psyche of many Southerners in that time. For me, the only hope for my future lay in the space program. The one common denominator between me and my father was a love for the space program. We watched every launch; every spacewalk; every space dock. We sat side by side and listened to the Apollo 8 astronauts read from the book of Genesis in December, 1968. From their orbit around the moon, these astronauts reminded us of where and how it had all began. What had gone wrong with this world? This world in which I lived was tilted and falling and smashing and crumbling into chaos. The only hope lay up and out — to the moon — to the stars. Star Trek and Walt Disney had given me the only hope for the human race. Progress. Future space exploration. And now, I was about to witness the crowning achievement of humanity — a man walking on another world for the first time. Neil Armstrong jerkily made his way down the ladder out of the lunar excursion module. He paused and faced the camera. This was the moment. My heart raced. My mouth grew dry. Keith fell asleep on the couch, but I did not care. 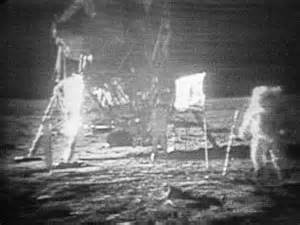 Armstrong almost leaped from the ladder and landed on the lunar surface. He did not sink. He was not pulled under by a lunar alien. He stood there — a human on another world. His words, blurred by static, echoed across the cold vacuum of space and changed the world. Unfortunately, my hopes for a wondrous future in space didn’t last long. When the oil crisis of the early 1970s hit, the space program was one of the first victims. The Apollo program was severely curtailed. There would be no gleaming space station like I had seen in “2001: A Space Odyssey”. There would be no colony to the moon or on to Mars. No Star Trek. No Tomorrowland. Instead, the future grew even more bleak and deadly. The Vietnam War escalated. More body bags came home. OPEC ruled the world. Nixon wallowed in lies and treachery. 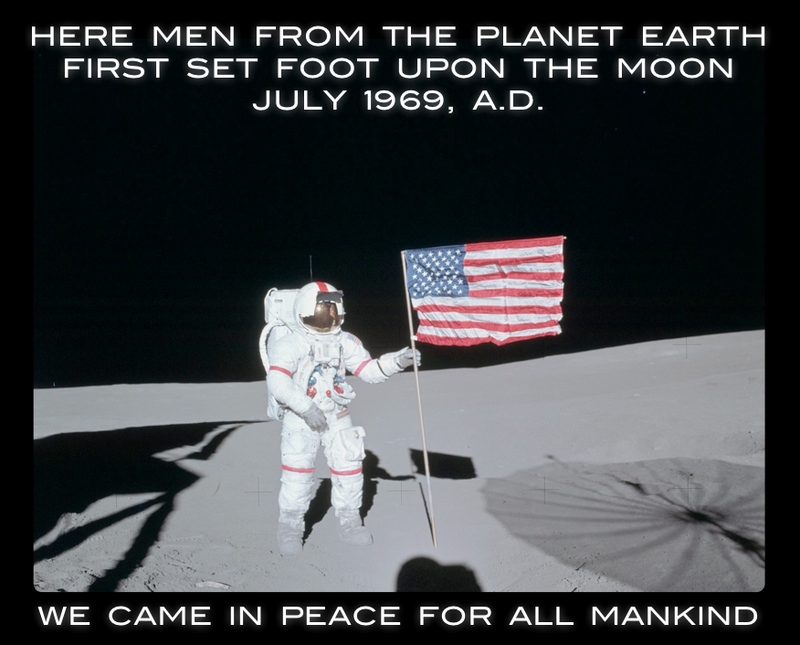 It has now been forty five years since man first set foot on the moon. An event that should have triggered unprecedented unity among all nations was soon buried by wars and protests and politics and lies. My generation was blamed for the change in society that followed. Today, I look up at a full moon, a moon that will appear larger than normal throughout the rest of this year for astronomical reasons no one really cares about or can understand. Our world has not changed that much. We are still embroiled in wars and conflicts. Socialism still sneaks in under the guise of David to capitalism’s Goliath. Communism has waned, but tyranny still rules in China and Russia; in South America and Eastern Europe. Body bags are more prevalent than ever. Peace is a distant, almost impossible goal. Fifty years has brought great technological progress. We are more informed and more connected than ever. But, we also less wise than ever and more alone than ever. Man is far from kind. Mankind is far from peaceful. We are still a work in progress. There is a new generation, the millenials. I have two children in that group. Some have criticized them for being a narcissistic, self absorbed, materialistic generation. Funny, but many of the same things were said about my generation. Maybe mankind will always fall to that level no matter how enlightened or advanced or progressed we may be. But, I see hope in this generation. I see a thirst for authenticity and a hatred for pretension. Therefore, please always seek the truth and do not buy into the thinking that truth is relative. Truth is true at all times for all people in all places. Even on the moon! In this generation, I see a desire to help the helpless, the hopeless, the needy. Therefore, please extend the same mercy and compassion you would show a homeless person or a starving child to that person in the line in front of you who is driving you crazy. Kindness and mercy should have no limits — they are for everyone. I see in this generation a disdain for profiling and pigeonholing and stereotyping. Therefore, please treat everyone as equals and never fall into the trap of thinking that just because someone differs from you in their opinion or beliefs, no matter how unsavory, that they are automatically wrong. Be tolerant of all points of view and respect a person’s right to hold their opinion even if you think they are wrong. Tolerance has morphed into intolerance in our society and politically correct thinking is killing freedom of thought and expression. Stop for a moment and look at the date on that plaque. July, 1969 A. D. We no longer use A. D. Why? Because A. D. stands for “Anno Domini” or the year of our Lord. And, we no longer believe in the Lord. We no longer believe God decreed a pattern, a year to year metanarrative, a Story to our lives and our reality. Cold and stranded on the bleak surface of the Moon is our last bastion of Belief! There was one development in 1970 that is forgotten. It is immortalized by a cover on TIME magazine. Young adults were so disillusioned by the “establishment” they found truth in the teachings of Jesus of Nazareth. 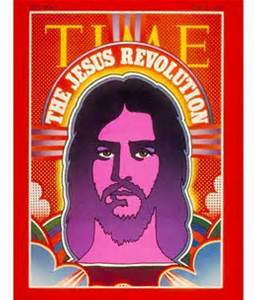 The “Jesus Revolution” stopped the downward spiral for a moment. Young adults bitterly disappointed by the chaotic world around them found a source of peace and tranquility. You see, “in my opinion” there is a higher path that leads to true Peace. There is a foundation for our western culture based on the teachings of Jesus of Nazareth. Those teachings have been lost in the strident call for abolition of religion and a growing hatred for Christianity. Therefore, I suggest that Google is NOT God and knowledge is NOT wisdom and there is merit to rediscovering the simple lesson of unconditional love and grace found in the teachings of the Prince of Peace. If we ever hoped to go anywhere, especially to the moon, in “peace for all mankind” then we must start with the Man who taught the true meaning of peace. Tonight, when you look up at the stars and the moon and wonder if our salvation lies beyond this earth, remember the Peace that was brought to us by a true extraterrestrial! But, of course, that is just my opinion. Need a good summer read, check out my Jonathan Steel Chronicles on the book tab above or at 11thdemon.com and return to my blog on Monday for a review of Andrew Peterson’s book, “The Warden and the Wolf King”. Posted on July 18, 2014, in Apologetics, Breaking News, My Writing, Steel Chronicles and tagged 1969, 1970s, A.D., establishment, hippies, moon landing, neil armstrong, Nixon, oil crisis, one small step, OPEC, peace, Prince of Peace, war protest. Bookmark the permalink. Leave a comment.